Spanish special foundation contractor, Menard has recently been sub-contacted by Matsa to work on the consolidation of very soft soils by preloading and inserting a vertical drainage system. With a contract value of over €500,000, Menard started the project with the installation of 130.717ml of vertical drains of 28m depth in triangular mesh of 2,50m and preloading by 8-12m height embankments. The project goal was to consolidate the deep mud layers (20-30m depth) under the area of the new Juan Gonzalo Dyke terminal. Working under designers Geolen/Azcatec, Menard reported that the existence of dense sandy layers at great depths (18-25 m) required predrilling 13 to 20m depth. 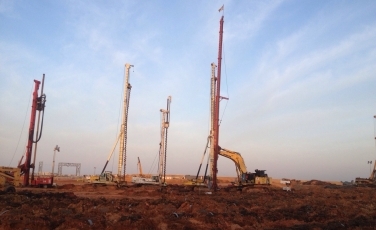 The predrilling was executed by three CFA piles, with a total of 97.827ml. The project was due to be complete in April 2015.